Fungiform papillae – are mostly present on the angles and sides of the tongue. They are mushroom-shaped generally red in color. They have taste receptors on their upper surface which are needed for distinguishing the five tastes: sweet, bitter, sour, salty, and umami. The fungiform papillae are connected with seventh cranial nerve. Filiform papillae – most numerous of the lingual papillae. These forms of papillae do not contain taste receptors. They cover most of the front 2/3 of the tongue’s surface. They are very small with a conical or cylindrical shape, arranged in rows parallel to the sulcus terminalis. 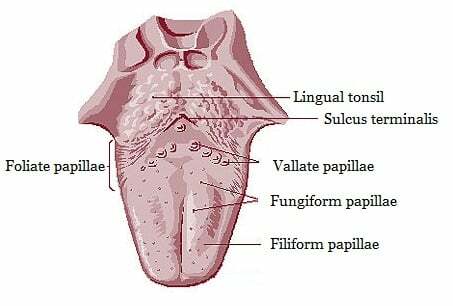 Foliate papillae – are located on the each side of the tongue, in front of the palatoglossal arch of the fauce. Their shape and size is variable. Sometimes they look to be small and discreet, and at other times they are big and prominent. Because their location they carry the risk site for oral cancer and tendency to be occasionally swollen and mistaken with tumors or inflammatory disease. The receptors of the gustatory sense are scattered over the mucous membrane of foliate papillae surface. Lingual tonsils are narrow behind to the foliate papillae. Circumvallate papillae (CP) or vallate papillae are located at the back of the tongue near the throat, arranged in a v-shaped form and are bigger than other papillae. Most people have from 6-12 circumvallate papillae. Their function is to taste bitter. These receptors can make a person gag from bad tastes. They are organized in two rows and each of them has 1-2 mm distance of mucous membranes attached for the bottom of a circular depression of the mucous membrane. In the circular depression, Von Ebner’s glands (VEG) ducts or lingual salivary glands removes their serous secretions and act as a dyke. The ninth cranial nerve or the glosso-pharyngeal provides nerve supply to the circumvallate papillae. It also supports to taste unique afferent taste perceptions. Thanks to the circumvallate papillae we are able to analyze any unpleasant taste due to presence but also to restrict swallowing of any poisonous matters as a reflex for not accepting bad/unknown taste. Normally 250 to 270 of bitter-responsive receptors/sensors are present in each circumvallate papilla but these numbers are different from person to person. Therefore, some people who have less circumvallate papillae enjoy the salty taste of cheese while those who have it more will complain for a bitter taste of cheese. Different compounds such as nicotine may decrease the number of circumvallate papillae and taste receptors. Genetics, gender, cuisines and different diseases also have a great impact on circumvallate papillae number. Women tend to have more taste buds compared to men which make them more delicate to bitter tastes. If papillae at the back of your tongue are inflamed and painful, you may have some infection such as sore throats caused by viruses. However, it is best to see a doctor if your sore throat lasts longer than a week or is accompanied by a high fever. Swollen tongue, open sores, candida infection and white or gray growths inside the mouth may also be the cause of circumvallate papillae reduced number. Circumvallate papillae can become inflamed and enlarged for a many various factors. In most cases it is not serious, but in some cases, it could be. Tongue biting during eating can in many cases be the cause of the enlarged papillae. Tongue burning while eating warm foods tcan also cause it. If the problem worsens and tissue of the tongue become infected, you will likely have enlarged circumvallate papillae. What are the causes of enlarged circumvallate papillae? May enlarged circumvallate papillae disappear on their own? Yes, enlarged papillae usually vanish on their own without requirement for medicines. Home remedies such as ice cubes, drinking cold liquids or cold compresses placed on the affected areas of the tongue may do pain and discomforts relief. Adequate water intake will certainly help to flush out toxic substances from the mouth or to reduce irritation and enlargement of papillae on the tongue. Good oral hygiene including periodic dental visits can reduce the risk of enlarged circumvallate papillae development. Bad habits such as nail biting, thumb sucking, or tongue biting may in some cases lead to enlargement of papillae. So stop with these bad habits. Also, try to stop or reduce smoking and avoid hot spicy foods for maintenance of good tongue health. Can gargling salty water relief discomforts caused by enlarged circumvallate papillae? If throat infections occur and cause enlargement of circumvallate papillae, salty lukewarm water gargling may be helpful. Can mint leafs be helpful for enlarged circumvallate papillae? Chewing mint leaves may relieve inflammation of the tongue and make relief of the tongue pain. Diet changes for enlarged circumvallate papillae? A balanced diet with vegetables and fruits can provide you essential vitamins that may compensate the vitamin deficiency so it may help to reduce the symptoms. Low fat dairy products such as yogurt can provide significant benefits for enlarged circumvallate papillae reduction by treating thrush infections. Drink soups with garlic, ginger and pepper in order to prevent oral infections recurrence. Are there some medicines that can easy enlarged circumvallate papillae issues? Antibiotics, antifungal and antiviral drugs. If there is some bacterial, viral or fungal infection in the mouth, then enlarged circumvallate papillae may occur. Topical antibiotics and/or antifungal or antiviral drugs may be prescribed in that case as they are indicated for treating mouth ulcers. In many cases, enlarged circumvallate papillae are result of underlying condition, thus by resolving the primary problem you will also resolve enlarged circumvallate papillae problem. Analgesics. Topical or OTC oral analgesics may be beneficial for pain relief. Vitamin B12, iron supplements or multi-vitamin, multi-mineral supplements. These products may be useful in the case of enlarged circumvallate papillae caused by vitamin deficiency. Glycerin topical. Topical application of glycerin may helps to reduce the trauma that may be the cause of enlarged papillae. Honey is natural antibiotic, antiviral and antifungal agent. It can soothe ulcers and may accelerate the healing process. It also has antioxidant properties. You can use cotton swab and dip it into the honey and then dab it on the affected area. You can also add glycerin or vitamin E oil or put it after or before the honey. Manuka honey has been shown as very beneficial for mouth sores. Baking soda or sodium bicarbonate is very helpful for treating different mouth issues. It is especially useful if papillae enlargement is caused by acidic drinks or foods since baking soda helps is alkaline and will neutralize the acid. It also contains ant-inflammatory actions and may fight germs and bacteria. But, always be aware not to take too much and too often because it may provoke burning sensation. Create a paste by mixing 1 teaspoon of baking soda with a little amount of water and then put the paste on the affected area. Do this several times a day. 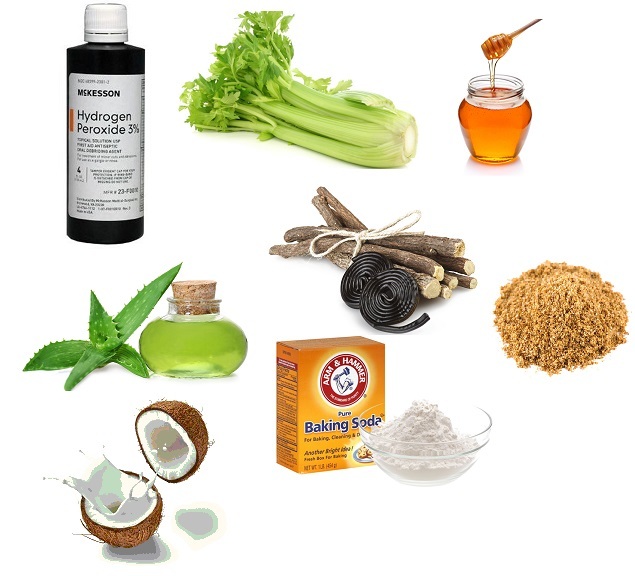 Add two teaspoons each of 3% hydrogen peroxide and sea salt into a glass of warm water and mix it well. Repeat 1-2 times a day. Make sure you do not swallow the solution. Mix 1 tablespoon of coconut milk with a little amount of honey. Massage the affected area of the mouth with it. Do this 3-4 times a day. You can also rinse your mouth with fresh coconut milk or do direct light massage with coconut oil on the affected area. Do this 2 times a day, in the morning and evening. Aloe vera is known to have various health benefits. Except its anti-inflammatory, antibiotic, antiviral and antifungal properties, when applied to the damaged or inflamed area Aloe vera may relieve pain and promote healing. It has been shown that when used as a gel or juice it is effective for dealing with oral health issues such as mouth ulcers, inflamed or brned tongue, cold sores, gingivitis, and lichen planus. Chewing a fresh celery stalk may provide relief from mouth health issues due to celeries analgesic and anti-inflammatory properties. Furthermore, celery contains adequate amounts of vitamins B1, B2, B6, C and folic acid and may be. For best results, after chewing the celery stalk, keep the pulp on the affected area for about 10 minutes. In addition to healing, it will keep bad breath at bay. Different oral conditions can be healed with licorice root, since this herb works as a demulcent by forming a protective coat on the mucous membranes that reduces irritation and soothes open injuries. Licorice Root also contains anti-inflammatory and antimicrobial properties. Take 1 tablespoon of crushed licorice root in two cups of water for 2-3 hours and administrate it as a mouth rinse several times a day. There are also products on the market containing Licorice Root extract with deglycyrrhizinated licorice (DGL). It is available as chewable tablets or gargle dissolved in warm water.